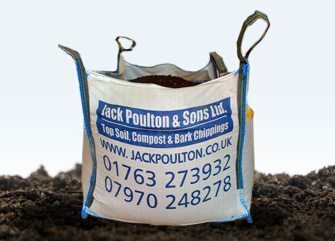 Jack Poulton and Sons are the leading suppliers of Cambridgeshire’s finest Fenland Black top oil, standard screened top soil, bark chippings, compost and soil conditioner in Hertfordshire, Bedfordshire, Cambridgeshire, Essex and North London. We are the leading soil suppliers in the Hertfordshire, Bedfordshire, Cambridgeshire, Essex and North London areas and supply a full range suitable for all uses. As experienced soil suppliers, we can also advise you on which products are best suited for your needs and requirements. 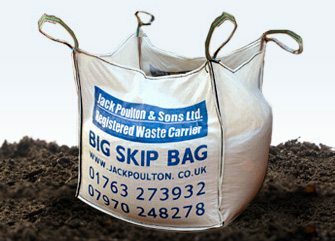 Why not fill the Jumbo bag with rubbish once its empty, we will then collect the bag full of your household or garden rubbish.